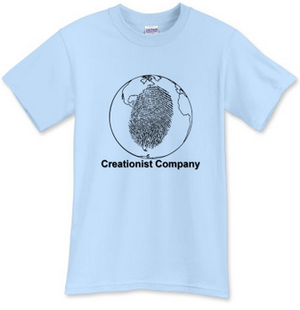 The Creationist Company logo, featured on there employee shirts. Creationist Company has no formal headquarters, but has volunteer writers from the states of Oregon to Oklahoma. The company exists almost exclusively on the internet, and spreads God's Truth through the Creationist Company website, their Facebook page, their YouTube channel, and has a small presence on Twitter. Creationist Company was the product of one preteen boy with minimal website designing experience. Started in his Portland, Oregon home in the December of 2008, Jake Doberenz and his brother, Kenny Doberenz, developed the first version of the Creationist Company website. What inspired Jake to create the company was his continuous debates about evolution with his best friend. The goal was to make sure more kids could see the Truth. Later, more teen writers were asked to join while the company began building a bank of articles. Those teens also write short stories for the Creationist Company site to appeal to those that don't want to read scientific articles, but who want to be entertained and taught Creationism in a fiction form. In late 2012, the company received confirmation that they are a not-for-profit charity with tax-deductible donations. Creationist Company actively works to help young people to realize that the evolution they are being indoctrinated with isn't all that it is cut out to be. To accomplish the outreach toward young people, many different mediums have been tested, yet few end up becoming a reality. The goal still remains to not only to reach out to kids and teach them the Truth, but to involve kids in Creationist Company in any way the can contribute, whether it is one of the following ways, or another. The Creationist Company writing staff, all young people, write articles from subjects ranging from Christian evidence, to Christian doctrinal differences to even ethics. The young staff lacks college degrees and expertise, but the writing is meant to be at a level a typical teenager could understand. Fiction stories at Creationist Company are easy ways to display Christian Truths in a way that many young people would enjoy. Originally, Jake Doberenz put out stories about his personal pet project--Creationist Guy--a superhero kid who fought fanatical evolutionists and defended the Faith. The stories were taken off the site to be conglomerated in a book format to eventually be published. There are those writers who wish to contribute poetry. The poetry reflects Biblical values. To handle challenges on the Creationist Company Facebook page, the Opposing Viewpoints Debate, or Viewpoints, was crafted to provide a civil, fair, and balanced written debate following a modified version of standard public debate. This allows creationist and evolutionists (Or young earth creationists and old earth creationists) to debate a specific topic in a manner that lets the reader decide what they think, rather than having a winner. The front side of a light blue Creationist Company employee t-shirt, that the volunteers who help out receive. One of the things that Creationist Company founder's brother Kenny Doberenz wanted to do, was create a movie production division of Creationist Company to create YouTube videos that glorify God with clean, funny and factual information. Bright Light Productions (BLP)was born to spread that bright light of Jesus around to people. It is a way to entertain, while showing how evolution is wrong. As well, some videos are meant to provide a funny, clean alternative to anything else someone could be watching on YouTube. Created all by a kid production group and young actors, BLP continues to grow. This page was last modified on 15 August 2014, at 17:07.